Ugly Holiday Sweater Party Time! The holidays are sneaking up on us once again. One of Duds by Dudes favorite festivities of the season is the infamous Ugly Sweater Party, especially since we have the unique ability to use custom embroidery and expand upon any already existing ugly sweater. 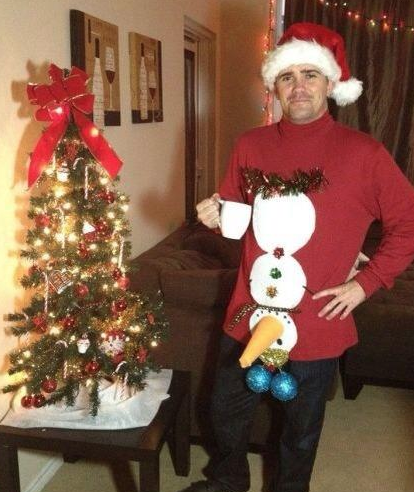 Throwing a wonderfully tacky sweater party is simple! All you need are party invitations, a festive banner, tacky decorations, festive food platters, a few games, and ugly sweaters to create an atmosphere full of holiday cheer! Its time to gather up those awful woolly sweaters you have hiding in your closet and wear them with pride as you mix and mingle with friends and family at a festive ugly sweater party. 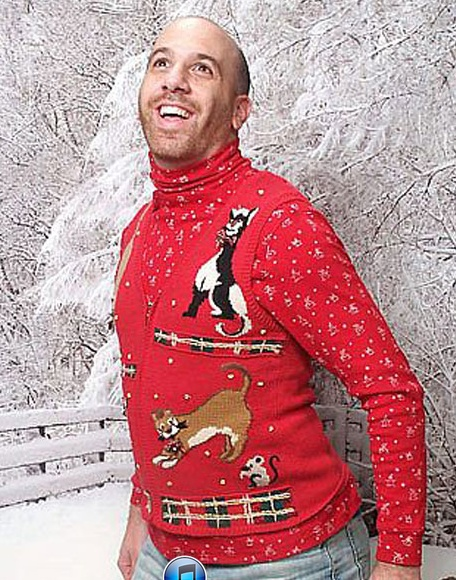 If you aren’t already the proud owner of an ugly sweater then the best place to start looking is thrift stores. You gotta get a good sweater base to work with, and if you’re going to be the belle of the ball you might want to consider some custom embroidery on that beezy (more on this later). Really anything goes at this point, the scratchier, baggier, and moth ball smellier = the better the sweater. So be sure to really dig deep into those racks for those hidden sweater gems at the back. If you actually want people to show up to your party you should send them an invitation. Otherwise you’re gonna get pretty snockered slurping down all that eggnog by yourself. 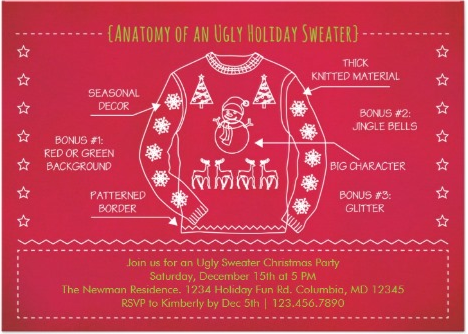 You will definitely want to incorporate the theme into your ugly sweater party invitation. If you really want to wow people with your invitation use as much puce green paper as you can stand to look at and cut snowflakes until your fingers go numb. Since this party may involve some planning ahead for your guests, it important that you include the details about the ugly sweater party theme on your invitation. Include the name of the event, name of the host or hostess, date, time, location, and RSVP info. If you’re having others bring food, create your event on Punchbowl and then use the potluck tool to set up food assignments. 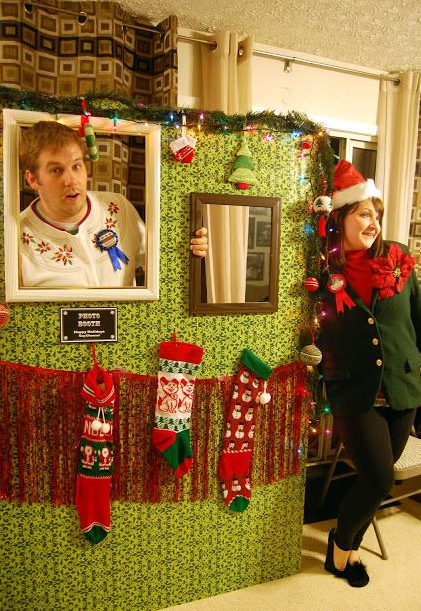 How do you decorate for a tacky holiday sweater party? With more sweaters, of course! You can use them as place mats underneath trays of food, table cloths, cut pieces to use as drink coasters, or just hang sweaters on a clothesline as a modified holiday garland. Another idea is to display awkward or embarrassing old family photos from holidays past. Have a good laugh looking at old fashions and uncomfortable, forced poses. What big and awesome party would be complete without a banner hanging from the fireplace with care? Duds by Dudes can print you up a delightfully tacky banner lickety–split with images of obnoxious candy canes, multi-colored lights, or ugly stockings. Just get crazy. Deck the house (and the halls) with these wild decorations and banners. The more outrageous and gaudier the better. Decorate with themes from famously funny Christmas movies. The “leg lamp” from a Christmas Story is always great. Try to decorate the main room with enough lights to make Clark Griswold happy. Your friends will love it. Christmas Movie Line Trivia – Have some Christmas movie lines ready to quiz the party goers on what movie it is from. Give extra prizes if they can name the character and the actor! Scavenger Hunt – These are classic and always fun. Really explore the space. Custom made photo booth – Check out our Pinterest page for ideas on how to make a photo booth. Have a safe and fun holiday season Dudes and Dudettes!